Day 1 of our visiting nephew! Mataya had a dentist appointment in the morning, no cavities every thing looks great! Then we went to pick up Austin from the airport. He is on summer vacation and we told him he was welcome to come for a visit, so he did! Here is day one! First day in the Northwest, June 25th 2008 Picked up from the airport, then hung around the house. We all went to the Oregon Zoo to see Grammy winner Kathy Mattea! I just love her! Click on the picture if you want to see a sideshow. We went to the Children's Museum and then the traffic was so bad we went to thai food and then ice cream. A fun filled day. So, I came across this picture the other day. 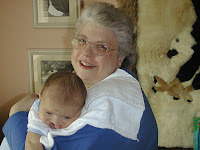 It is of my Aunt Jackie and my 1st child Dylan. Just look at them. Look at her! This is a picture of unconditional love. My Aunt Jackie had unconditional love for all babies no matter what. My Aunt passed away just before Christmas 2007. Had to go check out the Rose Festival since they had dinos there! View pics here! Went to a picnic the the group from Mothering. It is always nice to see like minded families.